So after proudly patting Samuel on the back yesterday for doing his own infusion site and insulin changeover, we have had the BM Day from Hell. We’re not sure if the cannula was inserted properly, was bent or if there was air in the tube or in the cartridge. Whatever the reason, he wasn’t getting some or all of his insulin overnight and this morning. As a result, his BM climbed steadily to over 15 before we corrected him, then changed his site. Of course, correcting him to bring him down at the same time as bolusing for food has meant he has bouced around all day. A graph shows how far off the target range of 4-7 Sam has been today. 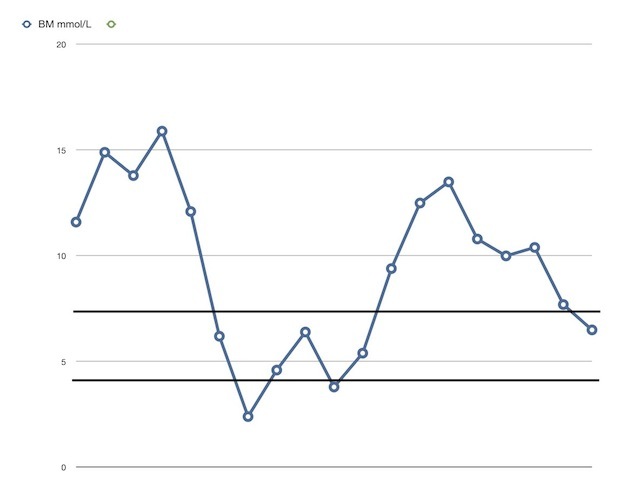 The graph shows the 19 blood tests we did through Monday from first thing in the morning until he went to bed at 9pm. Nineteen!!! I wonder how much that cost in the PCT in test strips. CGM anyone?? ?